Perk up your taste buds and stay warm this February by enjoying some good, heart-warming Chili. Make your Chili vegetarian by trying a new recipe or modifying your favorite Chili recipe to substitute Worthington Vegetarian Burger or MorningStar Farms® Meal Starters® Grillers® Recipe Crumbles™ in place of ground meat. 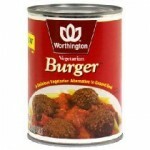 If you don’t have time to cook tonight, just open a can of pre-made Worthington Chili and enjoy. Combine all ingredients in saucepan and bring to a boil. Reduce heat and simmer for 10 minutes, stirring occasionally. Serve hot. Note: One 12 oz. 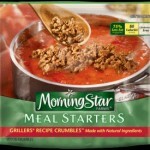 package of Grillers Burger Style Recipe Crumbles is equivalent to 1 lb. of uncooked ground beef.